I. Direct Injections uses a sharp small injection tip that places chemicals inside the tree WITHOUT DRILLING! c. Multiple injections can be injected & because the tip is so tiny & non-invasive one can be assured that these injections will NOT do harm to the tree! a. Children, Pets, & the Environment are NOT exposed to restricted chemicals sprays or containers. a. Injections are directly placed in the trees vascular system where the tree needs it & therefor the tree can immediately absorb it & the injection will begin to work where it is needed. 2. 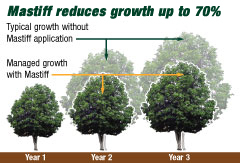 One can use a growth inhibitor to reduces the tree size so it doesn’t block a beautiful scenic view. 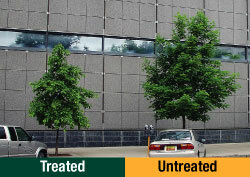 Growth Inhibitors slow the growth process in trees without doing any harm to the trees. Nutrients promote good health throughout a trees entire vascular system. 1. Pinscher Injections greatly reduce flowering and/or non-edible fruit dropping without compromising or damaging the health of the tree. For 30 years now, Brumbaugh Tree Service, LLC. has been offering tree care service to the areas in and around Quincy, Illinois. Owner, Larry W. Brumbaugh is an International Certified Arborist, who offers expert residential, commercial, municipal, and utility tree care & removal. We take pride in being experts at treating your entire tree, from its vascular system, to the roots, to the trunk, to the limbs & leaves. Read more about our history here. We understand at Brumbaugh Tree Service, LLC. that Mother Nature doesn't always choose the most convenient time to cause trouble. We are here for all your tree service needs whether it's 3 am or 3 pm.